The winery is a converted old stone farmhouse, where animal husbandry was practiced in the '50s. It spreads over two levels, the top level is devoted to wine making and bottle handling, and the lower level is indeed a basement used for wood aging and includes a small store of bottles ready to be marketed. In 2013 a store room was created at the top part of the winery: this is an open and ventilated space for drying the grapes for Sforzato wine production. The wine cellar is shared with another grower of the area, Siro Buzzetti from the wine farm Terrazzi Alti, and this proves the importance Giuseppe attaches to collaboration and friendship in performing his work as a winegrower. An investment is planned In 2014 for the purchase of 4 new Franco-German oak barrels produced by Mittelberger, a craftsman in Bolzano. Giuseppe Guglielmo actively collaborates with other wineries in Valtellina and with them he regularly organises joint wine tastings. The grapes are harvested and placed in small boxes to prevent their crushing and are transported to the winery on small tractors for being processed. In the winery, the grapes are de-stemmed, crushed and pumped into a fermentation tank. After a few hours, the alcoholic fermentation begins and lasts for the time necessary to complete the maceration of the skins in contact with the must. Then, the wine is drawn off and poured into a steel tank where a coarse racking takes place. The solid component, made of berries and skins, is put into a press for a light crushing and pressing, then it is poured into the fermentation tank. Pietrisco Winemaking: aging takes place in large oak barrels for 12-15 months, followed by aging in steel and aging in bottles for 6 months. 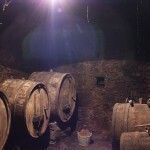 Umo Winemaking: aging takes place in steel barrels for a period of about 12 months, followed by bottle aging.